The Four seasons Nevis has a total of 196 rooms including 17 suites – 10 Executive Suites, 5 Ocean Suites ( 1 and 2 bedroom) and the Nelson and Hamilton Luxury suites. As well as the resorts rooms and suites there are also 30 private villas and estates with full access to the resort facilities. Resort Staff meet guests in the St. Kitts Arrival Terminal just outside of Customs. A 10-minute minivan drive and a 25-minute enclosed launch trip conveniently transports guests to the Resort. Transfer fees are applied to the guest's account. Nevis can be accessed through most Caribbean hubs such as San Juan, St Martin and Antigua which service both North American and European Airlines. The Four Seasons luxury resort on the island of Nevis, sister Island to St Kitts, is located in the Leeward Islands of the Caribbean and offers a range of luxury accommodation to suit all tastes and budgets. From spacious double rooms to the private and exclusive Villas and Estates spread among its stunning grounds as well as its own private golf course; this magnificent five star resort has it all. 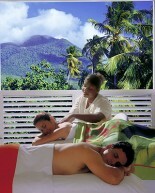 The Four Seasons Resort Nevis is the only full service, international standard hotel on the island. 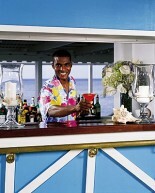 It has 196 rooms in low-rise accommodation set slightly back from the sand of Nevis’s best beach, Pinney's Beach. Most of the rooms face the water but those that don’t have a spectacular view of the golf course and Mount Nevis behind the resort. As well as the resorts luxurious rooms it is also possible to rent stunning villas and private estates located right on the golf course or set into the hillside allowing them to maximize the stunning views of the sea and the surrounding grounds. This unspoiled island offers visitors the opportunity to experience the Caribbean as it should be. The climate is pleasant all year round and there are no colossal hotel complexes, overcrowded beaches or busy commercial centers to detract from the natural beauty of the location. Guests can unwind in the award-winning spa or play golf amidst the dramatic views of one of the world's most scenic courses. More active guests will not be disappointed with a huge variety of activities on offer including extensive sporting facilities, water-sports, tennis, and even a croquet court! The Four Season Nevis has a good selection of restaurants within its grounds offering guests a variety of different cuisines. Mango, its newest addition, offers an inventive yet casual menu which is a testament to West Indian cuisine and culture. A bar and lounge within Mango is enhanced with nautical accents and features tropical drinks including the signature Mangojito and the Tipsy Palmer for golfers. The Dining Room is the more formal of the resorts restaurants and features regional cuisine with French and Asian influences. Neve, specializes in elaborate buffet style breakfasts then serves Italian and Mediterranean influenced dishes of an evening. The Pool Cabana is the perfect place to take a casual lunch of grilled fish or perhaps just a quick snack during the day. The Four Seasons Nevis has it all including 2 main swimming pools and a plunge pool in the spa, an excellent 18-hole Robert Trent Jones II golf course, putting green, chipping area and driving range, pro-shop, full service spa, full water-sports including snorkeling, windsurfing, small boat sailing (Sunfish, Hobie Cats), scuba diving and others, beachfront bocce, croquet lawn, 10 tennis courts, fitness centre, sauna and a library. The Spa at Four Seasons Resort Nevis is a sanctuary of well-being, offering clients the opportunity to reconnect with themselves. The Spa offers rejuvenating body treatments and a selection of massage therapies, all with the personalized Four Seasons touch. The Golf Course is a championship 6766 yard 18-hole course designed by Robert Trent Jones II and is one of the finest courses in the Caribbean. 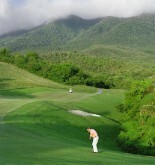 Set in Nevis’s lovely green countryside, the course rises steadily to 450 feet and offering fantastic views from several of its holes and along the course. The Resort is perfect for families and children are extremely well catered for. There is an excellent Kidsclub offering activities for children of all ages. The really specialize in families and do the extra special things to ensure that the kids have just as good a time as the adults.